Science is the seed to plant civilizations and to write history. This is exactly what the Ancient Egyptians realized 5,000 years ago in order to build their own civilization. Realizing the importance of science, Ancient Egyptians believed there is a god of science called T-hoth. Thoth’s body had human form but his head was the one of an ibis. His feminine counterpart was called Seshat and his wife was Ma’at. To show the importance of science in this bygone era and to show how strongly the Ancient Egyptians believed in the interconnection between different scientific fields with focus on specific disciplines and inventions, we will sail along the banks of the River Nile discovering parts of Ancient Egyptian history and how science has affected it. The god Ra was considered the god of all gods and the second one to rule the world in Ancient Egypt. Surprisingly, Ra was the god of the sun! The sun for Ancient Egyptians was the symbol of power and life and the god of the sun was considered the king of the world. 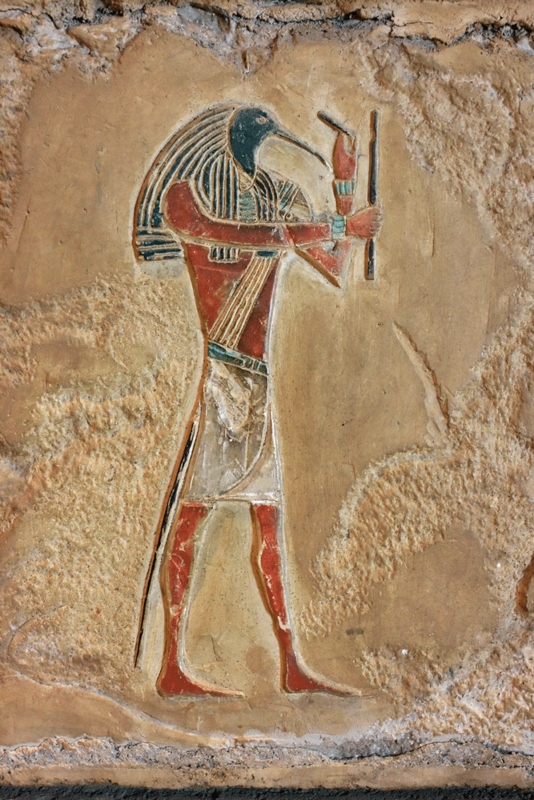 Thoth, the god of science, was the secretary and counselor of the god “Ra” due to the importance of science in this era. Not only that, but Thoth also married Ra’s daughter Ma’at. Thoth became credited by the Ancient Egyptians as the god of wisdom, magic, the inventor of writing, the development of science and the judgment of the dead. Without his words, the Egyptians believed, the gods would not exist. His power was unlimited in the underworld and rivalled that of Ra sometimes. In the Coptic calendar nowadays, the first month is named after Thoth and known as Tout. It lies between 11 September and 10 October of the Gregorian calendar. Interestingly, Ma’at was the representative of moral and physical law. Some scholars considered her as the most important goddess of Ancient Egypt. While Ancient Egypt is sometimes rather associated with mummies and pyramids, a great number of ancient Egyptian inventions are still being used in our daily lives. Let’s focus on eight of the most important fields for us nowadays. Paper and writing: Ancient Egyptians were among the first civilizations to make widespread use of the invention of writing and to keeping records of events. The earliest form of writing in Egypt was in the form of the hieroglyphics language, which consisted simply of drawings portraying a story. Papyrus was the first form of durable sheets of paper to write on. 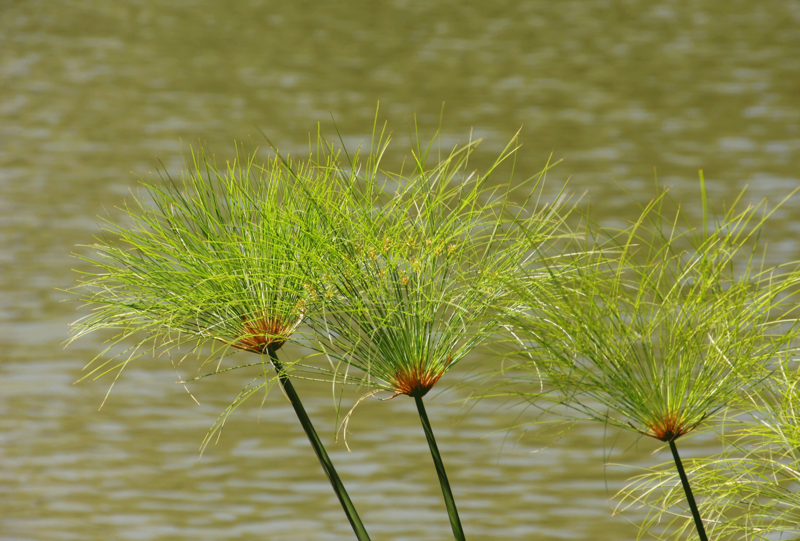 The material was named “papyrus” as it was made from the papyrus plant. To complete the writing process, one of the inventions in Egypt was, surprisingly, black ink. They were very talented at creating not only black ink, but many multi-colored types of ink and dye. The brilliant colors can still be seen today, thousands of years later. Time: The Ancient Egyptian calendar was originally based on the cycle of the star Sirius, effectively applying astronomy principles to develop an accurate calendar divided into 12 months, 365 days and 24-hour units. We still use their calendar model in our tracking of the days today. They were one of the first to divide days into equal parts through the use of timekeeping devices like sundials, shadow clocks and obelisks with evidences for even water clocks. Generally, the passing of the day was determined by the position of the sun, and the passing of the night was determined by the rise and fall of the stars. Construction: The Ancient Egyptians are known for their massive constructions and outstanding architecture such as the Great Pyramid of Giza, which is one of the Seven Wonders of the World. The ramp and the lever were two of the most famous construction inventions they developed, and the principles that guided them are still widely used in construction today. Ships and Navigation: Trade was an important part of ancient cultures, so having working ships was extremely important. The ancient Egyptians employed knowledge of the science of aerodynamics in their ship construction processes to create ships that were able to catch the wind and push vessels through water. They also developed the concept of using rope trusses strengthening the beams of their ships. They were also the first ones to use stem-mounted rudders on their ships. At first, they built small boats out of papyrus reed but eventually they began building larger ships from cedar wood. Medicine: Many of their most famous inventions were based upon the scientific principles the Ancient Egyptians discovered. They had a variety of medical techniques and cures for both humans and animals, along with a vast knowledge of anatomy, as they practiced mummification and preservation of the dead. One of the earliest accounts of medical texts originated in ancient Egypt: It described and analyzed the brain, providing the earliest insight into neuroscience. Cosmetics: Many people are not aware that toothpaste was actually an invention of Ancient Egyptians. As their bread had so much grit and sand in it, they experienced problems with their teeth. They invented the toothbrush and toothpaste in order to care for their teeth and keep them clean of grit and sand. The first toothpaste was made of a wide variety of ingredients, some included eggshells, ashes and ground-up ox hooves. Not only that, but they also invented breath mints to cover bad breath. The mints were made of myrhh, frankincense and cinnamon that were boiled in honey and shaped into small bite-sized pellets. Make-up: Make-up originated with ancient Egyptians, where men and women both used to put it on. While the make-up was used primarily for cosmetic purposes and as a fashion statement, it had another advantage as well, in that it protected their skin from the sun. Perhaps the makeup that they are most popular for was the dark kohl that they put around their eyes. Kohl was made from soot and other minerals and is the concept from which modern eyeliner originated. Mathematics: The great pyramids that the ancient Egyptians built required extensive knowledge of mathematics, especially of geometry. Math and numbers were used to record business transactions and the Ancient Egyptians even developed a decimal system. All their numbers were factors of 10, such as 1, 10, 100 and so on. Therefore, in order to denote 4 units, they would write the number “1” four times. 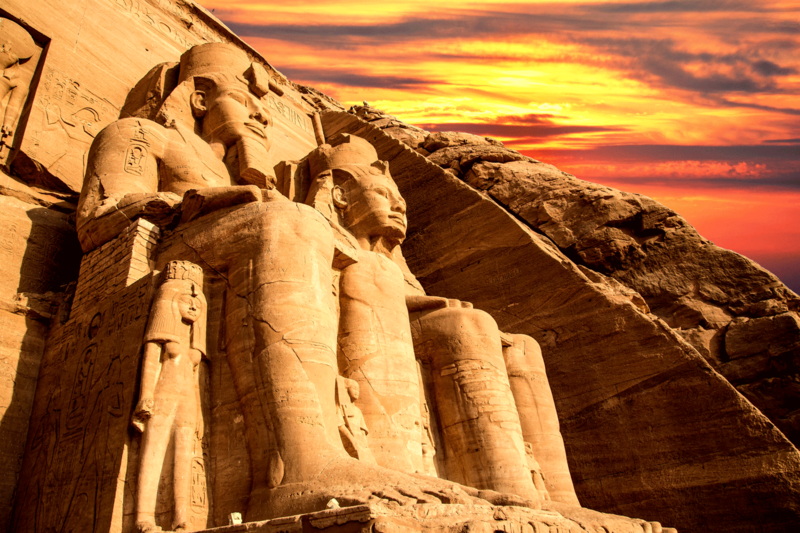 The beauty of their development in mathematical science is especially noticeable in one of their monuments that is still awe-inspiring until this very day – The Temple of Abu Simbel in Aswan, Southern Egypt. The sun becomes perpendicular on the face of the statue of King Ramses II (one of the historical Ancient Egyptian kings) inside the temple only twice a year; on October 22 and February 22. Surprisingly, these two days turned to be the king’s birthday and his coronation day respectively. The Sun first enters from the front side of the temple to a distance of 200 meters reaching the Holy of Holies, which includes a statue of Ramses II, surrounded by statues of two sun gods; Ra-Hor and Amun-Ra and the Sun then stays perpendicular on the King’s face for 20 minutes. Interestingly, there’s one statue in the temple that the sun never touches: The statue of the god Ptah, who was considered the god of darkness. This is called the solar phenomenon in Abu Simbel temple. The list of wondrous achievements continues, some even speculate that the Ancient Egyptians already possessed some knowledge of electrical phenomena. Lightning and interaction with electric fish was recorded within an Ancient Egyptian text referring to “high poles covered with copper plates” that some believe to be an early reference to electric principles. Inspired by the solar phenomenon and the power of the sun, combined with mathematics and the ancient trials to discover electricity, my research work is dedicated to solar energy and its conversion to electricity. In an attempt to refocus onto the importance of the sun as a clean and everlasting source of energy in order to satisfy one of the basic needs of modern life – generating electricity – my research is based on converting solar energy to electricity or what is called the “photovoltaic effect”. In my research, I work on fabricating solar cells based on thin film absorbers that have the potential of achieving higher efficiencies at lower costs. As Ancient Egyptians were talented in using chemicals for mummification, I am using some chemical compounds based on Copper, Indium, Gallium and Selenium (CIGSe) to fabricate thin film solar cell absorbers that are characterized with a high absorption coefficient leading to high efficiencies of conversion. These absorbers are hundred times thinner semiconductors compared to Silicon wafers (current state-of-the-art technology) with lower energy needs and simpler preparation methods. Solar cells based on these absorbers with other high band gap absorber materials that I invented consisting of Copper, Silicon and Sulfur (CSiS) could be able to form a multi-junction solar cell breaking current records of efficiencies especially if equipped with a solar tracking system. Hossam Elanzeery, Lindau Alumnus 2016, is currently completing his PhD degree at the University of Luxembourg working on the physics of solar cells with his Msc. and Bachelor degrees received from Nile University, Egypt (2014) and University of Technology Petronas, Malaysia (2010) respectively. His Master's thesis was completed in IMEC, Belgium.